Kickside Martial Arts offers a breaking week for its advanced junior (Green Belt and above) and all adult students. During breaking weeks, students are encouraged to bring in boards or patio bricks to break with a variety of trained techniques, such as: side kick, hammer fist, palm heel, and front kick. Depending on the level of ability, students will be allowed to raise the challenge by using increasingly advanced techniques, or a higher number of boards or bricks on one break. Students should bring four to six boards per breaking class (min). Although it is not mandatory that students bring in boards, it is highly recommended. DO NOT PUT BOARDS IN YOUR GEAR BAG — these bags are not intended to hold boards and will tear or rip as a result of too much strain or sharp edges from the boards. Board breaking is a required part of testings at the rank of brown belt and above. We firmly believe that the earlier students learn to break, the more confident they will be once it becomes a requirement for rank promotion. Boards may be ordered through Kickside or a local lumber yard (ponderosa pine #3 or white pine is ideal). Kickside board orders are offered in bundles of 25 boards. 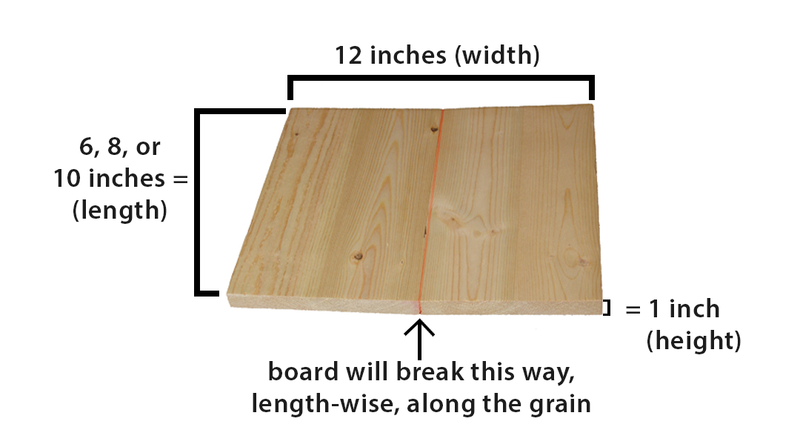 Below are board size requirements and exact specifications. Please pay close attention to grain direction if sourcing your own boards (they won't break if cut wrong)! Green - Sr. Blue Belts (kids): 6" x 12" x 1"
Brown Belts & Up (6-8 years old): 6" x 12" x 1"
Brown Belts & Up (9-12 years old): 8" x 12" x 1"
Brown and Above (13+) and All Adult Ranks: 10" x 12" x 1"
Note for breaking at a testing: There are special breaking requirements for each level. Although these requirements are reviewed in classes, students/parents should seek out an instructor to review the requirements prior to a testing. Breaks must be approved by an instructor upon submission of a testing application. Only one technique may be performed on cinderblocks at a testing for brown through probationary black belts.